Would you like an enjoyable and rewarding hobby? The EVLR is always looking for new volunteers to help operate and maintain the Railway. We have openings for Drivers, Guards, Station and Maintenance Staff. Whether you have worked on railways before or would like to learn a new skill, then why not come and meet the team. The EVLR is operated by Adrian & Sandra Corke assisted by small band of volunteers. Training is provided where needed, and qualification by examination is required for Drivers and Guards. LOCOMOTIVE DRIVERS: If you would like to train to become a steam locomotive Driver, we have vacancies. 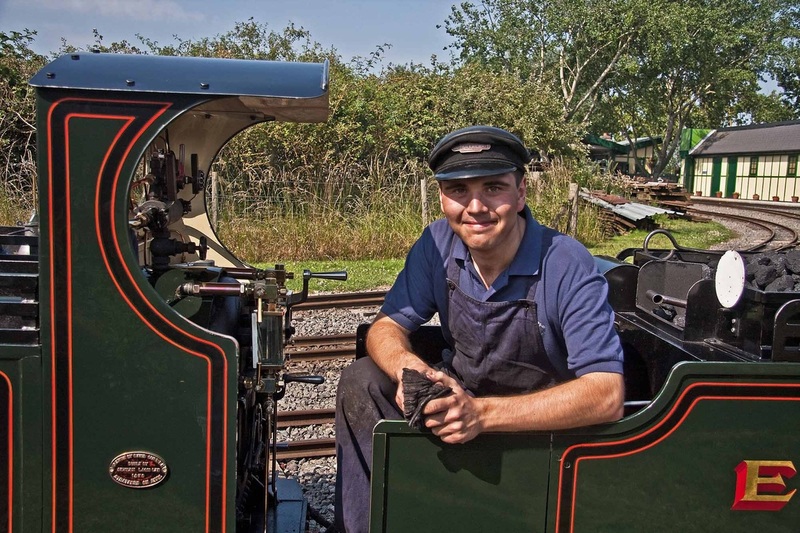 We provide all of the training required to operate one of our steam locomotives safely. Our training is on the job, and you will need safety shoes and overalls. This type of work is not for everyone, but can be very enjoyable and rewarding. GUARDS: If you enjoy customer contact, and are comfortable with responsibility for the safety and punctuality of the train, becoming a Guard is a great way to help the railway. TICKET OFFICE AND SHOP: A vital job that will suit people who enjoy customer contact, and are good with numbers. STATION STAFF: On busy days we need staff to man our platforms to assist our visitors, and help the Driver to turn the locomotive on the turntable. GROUNDS AND TRACK MAINTENANCE: We have over a mile of railway, which requires keeping in tip top condition. LOCOMOTIVES-STEAM & DIESEL: Maintaining, and overhauling our collection of steam and diesel locomotives. If you would like to help to operate the railway, unlike most railways, there is no membership fee, you need to provide your own safety shoes and overalls for locomotive duties. The Railway will provide uniform where required, this includes fleeces, sweatshirts, tee shirts and caps. If you would like to know more you can contact us on 01386 422282, through this website or drop in for a chat on any operating day.